The term customer of a bank is not defined by law. Ordinarily, a person who has an account in a bank is considered as its customer. Banks open accounts for different types of customers like an individual, partnership firm, Trusts, companies, etc. 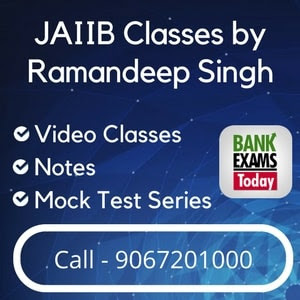 While opening the accounts the banker has to keep in mind the various legal aspects involved in opening and conducting those accounts and also practices followed in conducting those accounts. Normally, the banks have to deal with following types of customers. An individual can be a person holding a bank account for personal use. Such customers must comply with existing regulations and bankers must ensure that they do not open and use bank accounts for illegal purposes. The customer should be properly introduced to the bank. The introduction is necessary for terms of banking practice and also for the purpose of protection. A minor is a person who has not completed eighteen years of age. Any contract entered by minor is void and is not enforceable by law. This prevents minor to acquire property, dispose property or enter into any type of agreement. A joint account is an account which is opened by two or more persons jointly. It’s simply a joint debt such an account is opened by them for the convenience of the operation of the account as well as for the withdrawal of money after the death of any one of them. If she acts as an agent of her husband. A paid ana sheen woman observes complete seclusion in accordance with the custom of her own community. She does not deal with the person other than the members of her own family. As she remains completely secluded as the presumption in law. The banker should take due precaution in opening an account in the name of a park ana sheen woman. As the identity of such a woman cannot be ascertained, the banker generally refuses to open an account in her name. Illiterate persons cannot sign their names and hence the bankers take their thumb impression as a substitute for signature and a copy of their recent photograph. The application form and photograph should be attested by an approved witness. For withdrawing money he must attend personally and affix his thumb impression in the presence of an official of the bank for identification. Joint Hindu family it’s an undivided family which comprises of all male members descended from a common ancestor. A Joint Hindu Family is a family which consists of more than one member possesses ancestral property & carries on family business. The senior male member is called “Karta” and other male members as “coparceners”. Karta manages the whole business of the family and the liability is unlimited whereas coparceners have limited liability. Coparceners can be appointed as managers. The Karta has the power to mortgage and pledges the property of JHF for raising the loan. If a company is registered under companies Act has a legal status independent of the shareholders. A company is an artificial person who has a perpetual existence with limited liability and the common seal. These are the essentials documents required to open an account. Banks open accounts of unincorporated associations and clubs started for purposes of Sports, Recreation, Promotion of Fine Arts, and Education etc. Accounts are opened for reliable and reputed parties. These unincorporated associations have no legal entity. While opening an account in the name of association the bank makes detailed inquiry in the existing rules and regulations governing such associations. All usual formalities for opening the account are adhered by the bank. Bank also obtains the certified copy of the resolution passed by the Governing Body for an opening of the account in the bank and names of the office bearers authorised to open and to operate the account on behalf of the association duly certified by the Chairman are obtained. Copies of resolutions for electing them as Committee members duly certified by the Chairman. Bank keeps a copy of all the above-mentioned documents for its record. A partnership is a relationship between persons who have agreed to share the profits of a business carried on by all or any of them acting for all. Since a firm is not a person is not entitled to enter into the partnership with another firm or Hindu undivided family or individual. Therefore banks do not an open account where a firm is a partner of another firm. As per the Indian Partnership Act, the minimum number of partners can be two and maximum twenty. The number of partners is restricted to 10 if the partnership firm carries out business for banking. Minors can be admitted as the partner only to the benefits of the partnership. Trusts are created by the settler through executing a Trust Deed. A trust account can be opened after obtaining and scrutinising the trust deed. The Trust account has to be operated by all the trustees jointly unless provided in the trust deed. A cheque favouring the Trust shall not be credited to the personal account of the Trustee. According to the Indian Trusts Act, a ‘trust’ is an obligation annexed to the ownership of property, and arising out of a confidence responded and accepted by the owner or declared and accepted by him for the benefit of another and the owner. The person who responses the confidence is called the author of the trust. The trustee is the person in whom the confidence is responded. The person for whose benefit the trust is formed is called beneficiary. The customers of banks consist of millions of private individuals, hundreds of thousands of small businesses formed as private limited companies. Some persons like the minors, drunkards, lunatics and insolvent are not competent to enter into valid contracts. Some persons like agents, trustees, executors, etc. who act on behalf of others, have limitations on their powers. Thus requires extra care to ensure that their accounts are conducted in accordance with the provisions. 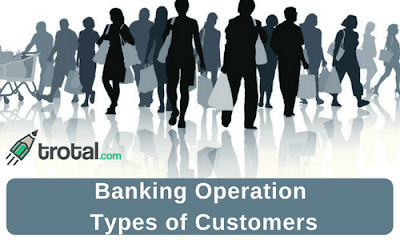 These are the major types of customers that come under banking operations.